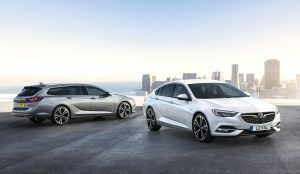 Vauxhall launches all-new Insignia at Geneva | Hoot! Available as a five-door Grand Sport hatch and Sports Tourer estate, the new range starts at nearly £1,500 less than the previous model. A ‘rugged’ Country Tourer estate will join the lineup soon. The new Insignia range gets a Front Camera System and Vauxhall OnStar as standard. The Front Camera System incorporates features such as lane keep assist, following distance indicator, forward collision alert, low speed collision mitigation braking and active emergency braking, while Vauxhall OnStar gives drivers access to a host of innovative services including automatic crash response as well as 4G Wi-Fi for up to seven devices, stolen vehicle assistance, vehicle diagnostics, destination download and smartphone functionality. This entry was posted in Vauxhall and tagged 4G, Geneva, Insignia, motor, OnStar, Show, Vauxhall, Wi-Fi. Bookmark the permalink.